Living with less. That messaging is coming on strong – and with good reason! This past week, the stores I visited were literally PILED with merchandise. It is time to stem the tide. Taking care of all the items you own takes time. When you cannot keep up with the amount you have, the overloaded systems begin to back up. If your closets are bursting at the seams, a sure-fire way to get organized for the long haul, is by becoming conscious about what you are buying in the first place! This is ... See More my challenge for you! If you do not have time to eliminate excess in your closets, basement, kitchen cabinets, etc. right now and are feeling frustrated, a very simple move in the right direction is to consider purchasing less. 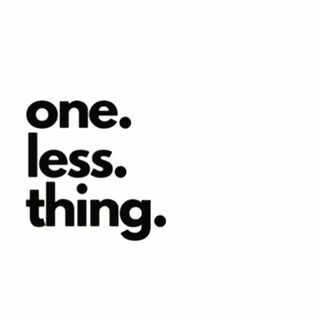 Just one less thing. Once a day. At the end of the day, become conscious consumers is better for our planet. So let’s get started! If this challenge inspires you, reach out and let me know what you did not purchase on a given day. I will be sharing my journey on social media this month and am excited to hear from you!